One of my favourite movie and wine pairings of all time was Quentin Tarrantino’s Pulp Fiction and a previous vintage of Elementis from Swartland producer Jurgen Gouws. 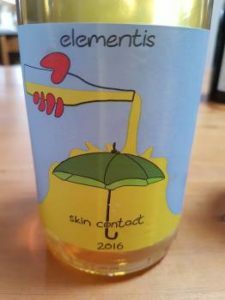 As with Tarrantino, Gouws favours the wacky over the technically correct, Elementis made from Chenin Blanc and featuring extended skin contact. The current-release 2016 was left on the skins for 16 days. The nose shows top notes of flowers and herbs before white peach while the palate shows great fruit concentration and fresh acidity before a long and savoury finish. Utterly delicious. Approximate retail price: R240 a bottle.